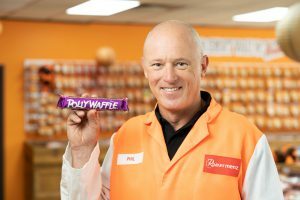 Fourth generation family owned Australian confectionery company, Robern Menz has signed an agreement with Nestlé to acquire the Polly Waffle brand. Under the agreement, Robern Menz will take ownership of the brand and trademark, as well as the famous recipe. The sale comes just 12 months after the South Australian based company announced the acquisition of Violet Crumble from Nestlé, which the company began producing and distributing in October 2018. Robern Menz is passionate about re-introducing the iconic brand and chocolate bar to Australians. The company will undertake the project to build capability to recreate the much-loved Australian icon and assess commercial viability to produce from its factory in Adelaide. Robern Menz CEO, Phil Sims says this latest acquisition is a new and exciting challenge for the business. “With production ceasing almost 10 years ago, Polly Waffle has entered into the territory of Australian legend. There are kids and even young adults out there who don’t really know what a Polly Waffle is and haven’t tasted it before, but there are also many devoted fans who have been campaigning hard for its return,” says Sims. “Australia’s food production industry is important to our future economy and sustainability. We believe our role and contribution is keeping as much manufacturing here as possible and creating jobs, and we’ve been doing this for over 150 years,” explains Sims. Polly Waffle was created by Melbourne based business Hoadley’s Chocolate in 1947 and was acquired by UK based confectioner Rowntrees in 1972 and then by Swiss based Nestlé in 1988 when it bought the Rowntree Hoadley’s business. The Polly Waffle chocolate bar was discontinued by Nestlé in 2009. This January, Robern Menz also announced another much-loved return to our shelves – the Violet Crumble 180g bag. The new format – which comprises bitesize versions of the chocolate bar will be available in a number of national retailers from March 2019. Having been withdrawn nearly ten years ago, there has been huge consumer demand for its return. As soon as it acquired Violet Crumble in 2018, Robern Menz has been eager to reintroduce this format, which offers a great alternative option for those wanting to share with friends, family or colleagues, manage portion control or enjoy on the go.